I’m pleased to announce a new TKActions panel for Photoshop. This is the fourth version of this custom luminosity mask panel (V4) and has been completely rebuilt. It takes advantage of new capabilities in Photoshop extension panels–smaller footprint, smarter buttons, updated interface, and more features–to provide users a practical and efficient way to add luminosity masks to their workflow. The top part of the panel is a Photoshop control center. It executes many common menu commands and keyboard short cuts with the click of a button. Most of the usual steps for developing an image can be accessed from here. The bottom of the panel has three tabs. The Spectrum tab provides a new interface for creating luminosity masks. The widths of the buttons in this section roughly match the tonal ranges that will be selected in the image. Standard luminosity masks (Lights/Darks/Midtones) as well as subtracted and zone masks can now all be created with a single click. In addition to the Spectrum tab, the bottom of the panel also has an Actions and Basic tab. The Actions tab has several useful functions for enhancing the image and a web-sharpening section for preparing images for jpeg output that has been completely redesigned. The Basic tab provides an alternate interface for using luminosity masks with Curves and Levels adjustment layers and as Channel masks and selections. 16-bit luminosity masks−These were discussed in previous blog posts. 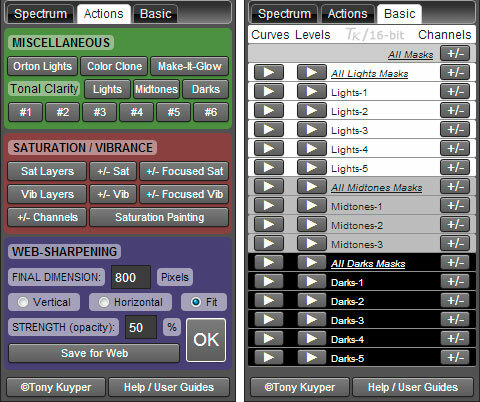 Spectrum selection−Creates ALL masks, including zone and subtracted masks, that were available in the previous version 3 panel. Integrated actions−No more action sets to install on Photoshop’s regular Actions panel. Smart buttons−Panel buttons monitor the Photoshop workflow and only fire at the right time. Toggle buttons−Allows one button to perform multiple tasks. Active selection indicator−Keeps track of when there is an active selection even if the marching ants aren’t visible. Updated web-sharpening−No more fixed-dimensions. Users can enter their preferred dimension from 100 to 3000 pixels and easily tailor the level of sharpening to their taste. Condensed history−No more scrolling histories for buttons that execute multiple steps. One button, one click, one entry on the History panel, Ctrl/Command-Z to undo it. Tonal Clarity−A saturation-neutral method for enhancing detail and structure in an image. One-click Photoshop control−Many Photoshop menu commands and keyboard shortcuts can now be accessed from a color-coded interface for more efficient image processing. Midpoint rollovers−Choose among the different luminosity masks based on tones sampled from the image. Rapid clear channels−Quickly remove all alpha channels from the Channels panel to decrease file size and memory use. Creative Cloud installation−Once acquired, the new panel and future updates are automatically installed on computers signed in to the Creative Cloud desktop application (see this video and this one). The new V4 panel is designed to help take the guesswork out of luminosity masks and make them more accessible than ever. It’s also meant to make other actions and tools more available to allow photographers to creatively develop their images. My website has additional information. The complete Instructions PDF can be downloaded and covers all aspects of the panel. Sean Bagshaw has also recorded a corresponding video series called the Video Guide to TKActions that explains the new panel in detail. Samples can be found below. Purchase options for the new panel and videos are on the Special Offers page. A German version of the panel and accompanying videos are available on André Distel’s website. AWESOME!! Just in Time ~ Thanks again Tony for all that you do. I’ll also pickup Sean’s video pack on the V4 Panel ~ Take Care! wow, a new learning curve. Looks wonderfully powerful and organized. just gotta get used to the new interface. you are the king of luminance masking, Tony. To describe it using Plato’s allegory of the cave, your tools are the light, everyone else’s tools are the shadows on the wall of the cave from the light illuminating the cave. Great job Tony. Worth every penny! All installed fine, except that the panel didn’t display correctly until I closed and restarted Photoshop. The attached screen grab shows how it looked before restarting PShop (CC 2015). In addition to all the great masking stuff, it’s so helpful to have the one click buttons for common stuff that was always several clicks to accomplish. The panel has some embedded script libraries that Photoshop needs to load. If it doesn’t load them the first time, the panel won’t display right. Simply closing and reopening the panel usually fixes this, and then the panel displays correctly from then on. The version 3 and Version 4 panels can be installed simultaneously in CC 2015, or the previous version of PS CC too. The previous version of the panel is not affected by installing the V4 panel. They’re all independent panels. Because Adobe now controls sale, distribution, and installation of the latest version of the panel, I don’t have a way to provide discounts or an upgrade path for previous customers. It’s a bit unfortunate, as I always did this in the past, but AddOns is now Adobe’s preferred method for installing the panel in CC applications. Thanks for clarifying, Tony — the v.4 panels look cool and are no doubt worth the expenditure. Thanks Tony! Your tutorials and actions have really contributed to my post processing skills. One question: what happened to the triple play? I can’t seem to find it anywhere in the new panel. The new panel has the actions directly coded into the panel itself. The Triple Play actions are huge. I was concerned both with the amount of memory they might take and the effort to actually get them coded in. So they didn’t make the final cut. If you have the TP actions, the action sets can still be placed on Photoshop’s regular Actions panel and run from there, and even recorded into one of the six personal actions buttons on the new panel if you have some specific TP actions you use a lot. i’m very impressed with the new panel and the user interface. The spectrum interface is a great way to present the tonal selections with visual presentation of what areas of tonality they will impact. I mourn the loss of triple play. Lights, Midtones, Darks luminance masked high pass sharpening is not the same thing as the triple play methodology. I like the results of this new tonal clarity process but I will still also use triple play, using the v3 panel, when the results merit it. Overall great stuff. thank you. and thank you for adding button to turn marching ants on and off. I hate the default photoshop keyboard shortcut for turning it on and off. Better photoshop living through thoughtful buttons. Finally, I look forward to working with version 4. Thank you so much for this great TK panel !!! Luckily, there are still people, like you, who share their experiences with others. God bless you.